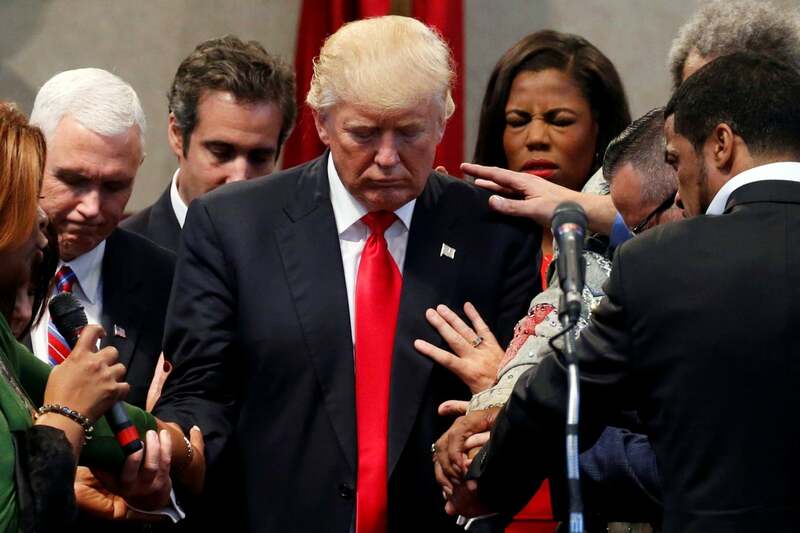 Yea, it doth seem that Donald J. Trump loveth America and God, probably in that order, yet there is one he surely loveth above all others, and that is Donald J. Trump. And mammon he also loveth much, and we rejoice that he hath not a heathenish middle name nor a dark countenance as did he that ruled in the days before Donald J. Trump was anointed to be a king among us. Donald J. Trump loveth also the fearful potentates of this world and he hath reserved hellish damnation for the winsome prime minister of Canada. Friends are enemies, up is down, and verily, he doth consort with wicked men and declares that it is good. And it doth seem that Donald J. Trump extends grace towards all that do but see it and welcome it! His graciousness is great, verily it is huge, because it has thus been revealed by a peculiar priesthood, a cult of Conservative Christians, a funk of fundamentalists who alone among us surely knoweth all things. And it doth seem that Donald J. Trump loveth not golf courses, yet walks amongst them more than all who came before him. Yea, it is a swampish mystery. And is it not surely that thrice calling upon Benghazi is also a mystery? It is a strange thing, yet who among them is steadfast in seeking the truth that can set their captive minds free? Verily, my brothers and sisters, again we beseech thee to keep thy blithering succinct. Seriously? Maybe I can enlighten, I’ll try to be gentle. When Barack and Michelle won the top job in America, instead of being thankful and setting out to help the black population still at the bottom of the heap, Michelle insulted every proud, successful black American by saying “For the first time in ‘my’ adult life I’m proud to be an American” and Barack steered clear of dangerous city streets, preferring golf courses and galloping up and down the steps to Air Force One! Democrats. Donald Trump loves America and God. He’s not the one who went out of country and insulted America and Christians. That was POTUS Barack Hussein Obama. Democrat. It was not Donald Trump who kept his lips sealed while our cops were humiliated in American streets. That was POTUS Barack Hussein Obama, the same one who once said the cops were stupid. It was not Donald Trump who denied protection to Americans at Benghazi, then lied when they were murdered by terrorists. That was Hillary, in the Obama White House. Democrats. All these things have been done in plain view, right before our and God’s eyes. Yet for Dems, there are not excuses, you would have to first acknowledge the wrongdoing. Which they never will. For reasons only God knows, He is allowing the liberal agenda to be swallowed by way too many Americans who believe the lie that government can do a better job running their lives than they can. Prayer changes things. We Christian conservatives have an obligation to see people receive the blessed life that every person can achieve, with the pride that it will bring. I still believe that it is important to speak out on the things that we know are not good for the American people, but the most important, vital tool is prayer. We serve a mighty God who can move mountains. God bless America, President Donald J. Trump, military, law enforcement, firefighters and all those in need. P.S. If you can’t see the graciousness Donald extends to others, it’s only because you don’t want to see it. It’s so welcome! …and this, titled “Turning a blind eye”, was what torqued off Contrary Mary’s letter in the previous comment. It was in the Sunday, May 27 2018 CE edition of the Sentinel Record. We have an occupant in the White House that seems to be there for his own profit, not to lead or govern this country. Time after time, within a day after he makes a decision, we learn that it benefited one of his hotels. Now once again, after pulling out of the Iranian agreement and placing sanctions on our allies decides it’s OK for a Chinese manufacturer (ZTE) of cheap cellphones who says they will lay off 70,000 Chinese and close down because some of the parts are made in the U.S. and we won’t ship them. Chinese government calls the occupant of the WH and a day later it’s OK for this one company to violate sanctions and Chinese government hands out $500 million to a project in Indonesia for a theme park that will feature Trump hotels, Trump apartments and so forth. This is a clear violation, again, of the Emoluments clause that this person in the White House has flaunted since he took possession of it in 2017. Never did he consider that the loss of 70,000 Chinese jobs could mean the addition of an equal number of U.S. jobs? Most of our middle-class jobs went to China and he did promise to bring jobs back, yet he did not seize on this opportunity to keep that promise. Never in the history of our country have I seen such pay for play graft and corruption in our White House and government, yet excuse after excuse is given this person. Something not afforded the Democratic president or party. This belated response from Mary Robinson was published Monday, June 2, 2018. Apparently the last refuge of being mocked and ridiculed is condescension and more hyperbole. Her blithering is somehow validated by “many Sentinel-Record subscribers” who “yell out” to her to keep on keeping on, so we can look forward to more of the same. Enjoy. In response to “Gentle enlightenment,” Sunday, June 17. I take it the writer didn’t like my letter. Changes nothing — the “cute” poetic sarcasm was entertaining and amusing until we got to yet one more liberal lefty agreeing with Hillary on the four Americans who came home in wooden boxes when she yelled, “At this point, what does it matter who killed them?” What does it matter who killed them? Ask that if it was one of your family! This isn’t the first request I’ve had to shut up about Benghazi. As to my “vain repetitions” — you might be surprised to know how many Sentinel-Record subscribers yell out to me, “Mary, keep writing those letters, we need them!” Maybe not so “vain?” Ever hear of the patience of Job? I could never attain as Job did, but he is a marvelous example to trust God. God bless the USA, President Trump, all who proudly serve and protect us and all those in need.